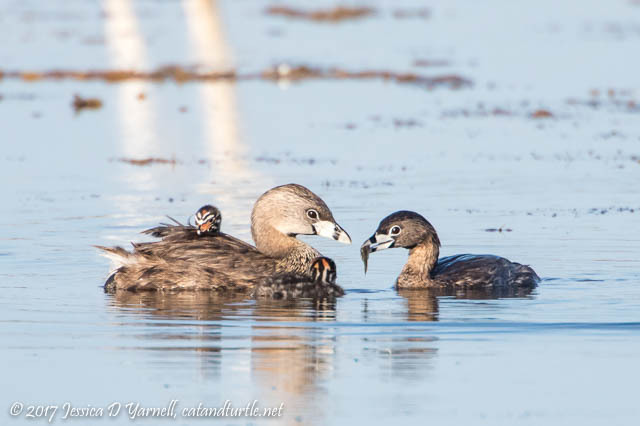 Blog > Beyond the Backyard > Another Pied-Billed Grebe Family at Lake Apopka! 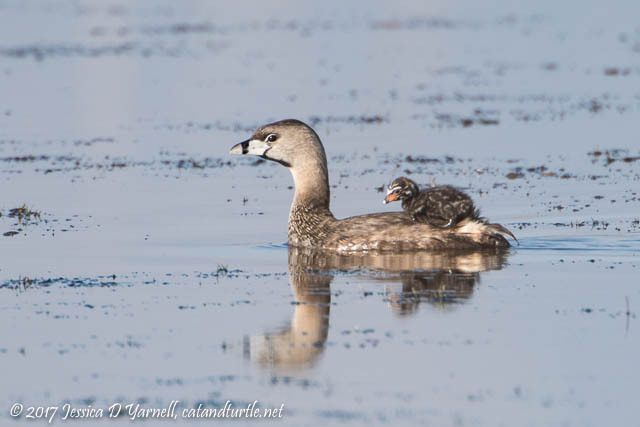 Pied-billed Grebe babies spend a good deal of their first few days riding around on Mom’s back. I got to see lots of piggy-back rides one morning. It’s so sweet to watch. 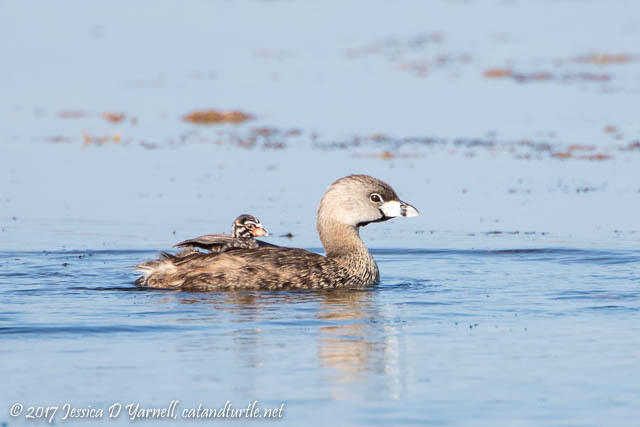 One baby continuously sought Mom’s back while the other swam proudly by her side. This mother seemed to have little patience with piggy-back rides. She’d let Junior tag along for a few minutes, then fluff up her feathers and shake him off her back. He was the more stubborn of the two, though. Every time she shook him off, he climbed right back up! “Sorry, Mom, but I don’t feel like swimming all morning!” Sometimes it would take him several minutes of vigorous wiggling to get back into place. This next image was one of my favorites from all three mornings. 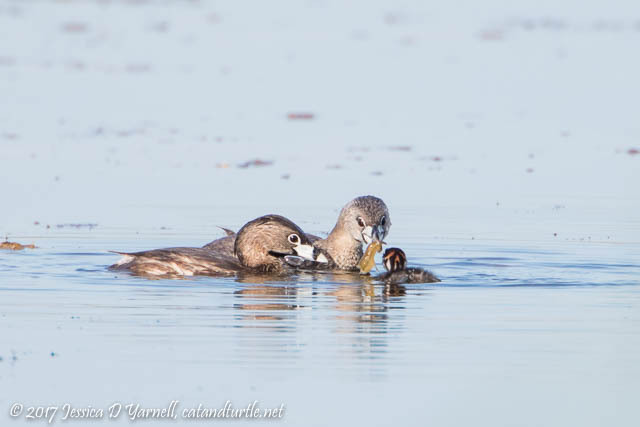 Mom had a baby on her back when Dad swam up with a fish for the other baby. 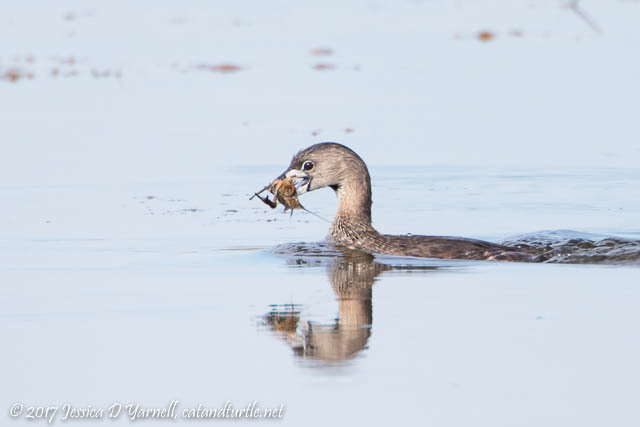 Both parents looked on carefully as the little grebe swallowed the fish whole. The nest was located amongst the lilypads. The family spent some time there on the first morning, and I never saw them on it again. 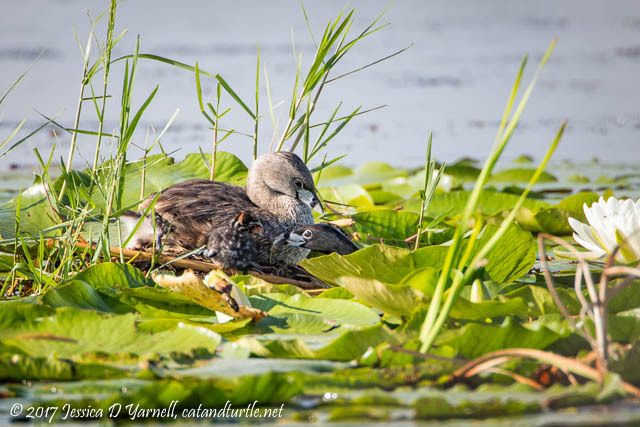 Here Mom sits with one baby on her back, tucked in under her wing, and the other baby is out on the nest. Dad swam in through the lilypads with a fish for the baby. It took a bit of coaxing to get the baby to swallow it. Much of the time I spent with this little family involved feeding. It takes quite a bit of effort to feed two growing babies! Mom primarily took care of the little guys while Dad went in search of food. Here’s Dad presenting a fish to one of the babies. 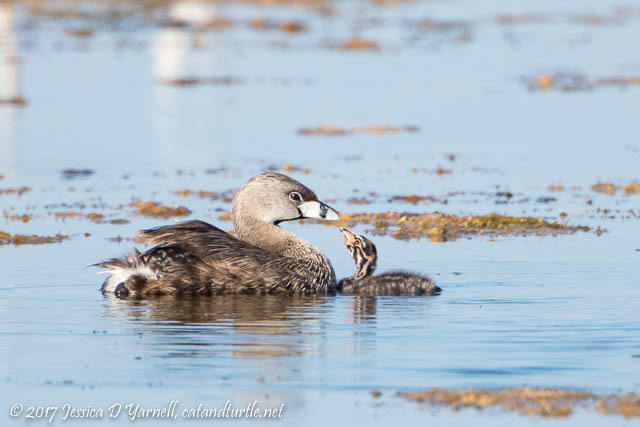 Both parents looked on so carefully when each baby was fed. Often it was a long process. Dad would hand over the fish, and the baby would try to swallow it. But more often than not, the baby would drop the fish. So Dad would have to dig around in the water to find it again, then hand it back to the baby. And so continued the process for several iterations until the baby finally would get the food down. Dad seemed to understand the importance of piggy-back rides more than Mom did. 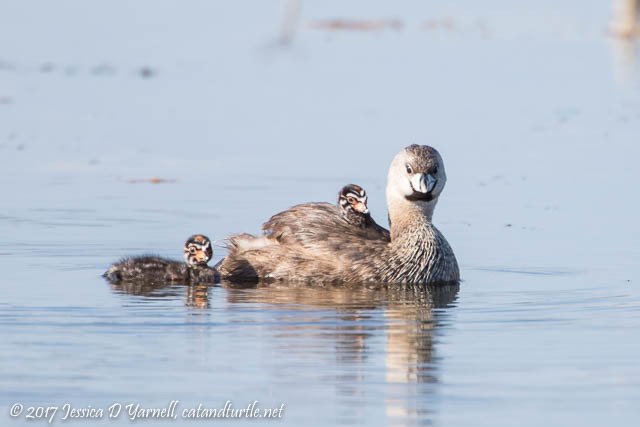 While she was quick to shake the babies off, Dad would let the baby stay on Mom’s back while he fed him. Look at Dad stretch his neck to reach in under Mom’s wing! The babies were quick to tell Mom when they got hungry. 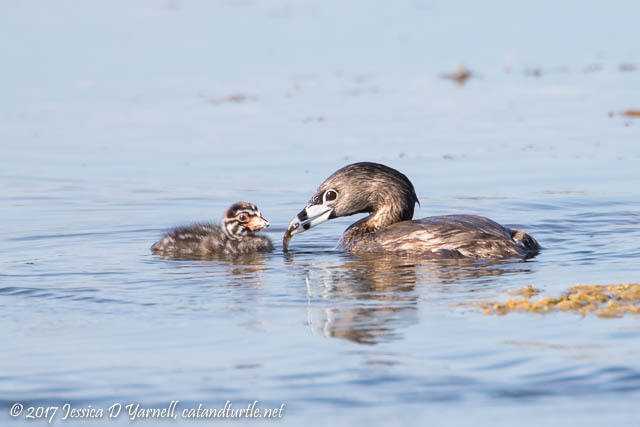 Here the older baby nuzzles Mom’s beak to remind her to feed him. 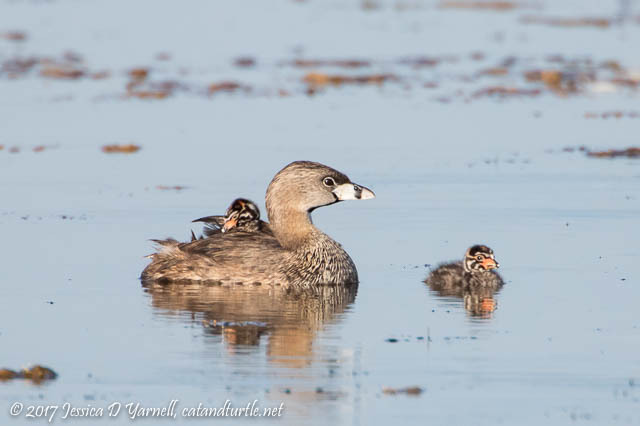 Peek carefully under Mom’s wing to see her hidden cargo! I wondered if these were first-time parents. 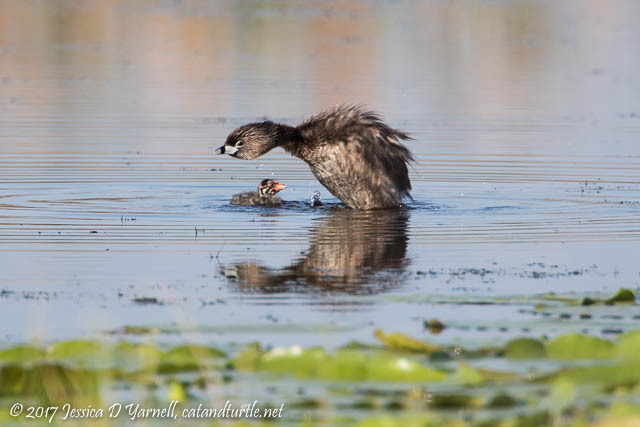 It didn’t seem right for Mom to keep shaking the baby off her back. Then Dad brought in a huge fish for breakfast. It was just as big as the small baby! Over-zealous Parent Brings in Huge Breakfast! The baby saw the huge fish and gave a look that said, “Mom, you’ve got to be kidding!” The dad repeatedly handed the fish to the older baby. 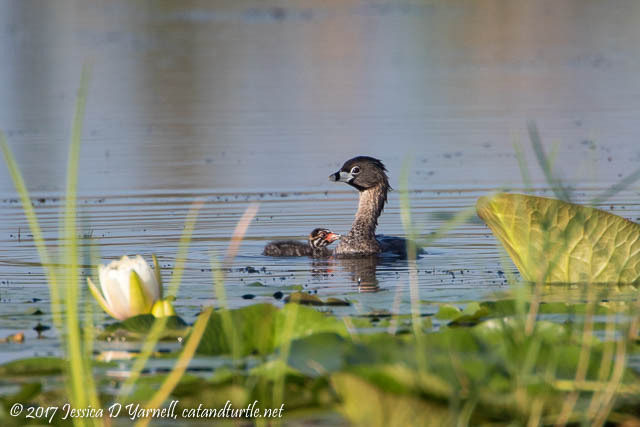 Mom swam over with the second baby on her back. The younger baby watched with great interest as his brother struggled to eat. Finally the parents seemed to figure it out. They broke the fish into smaller pieces and handed it off to both babies. Mom, You’ve Got to be Kidding! 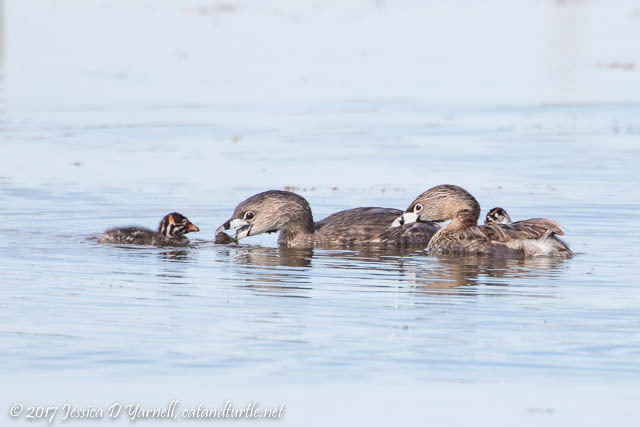 After breakfast, Mom floated around lazily with the babies. I couldn’t get enough of the “baby on the back” shots. They were just precious. Thanks! This little family was a joy to watch. Great fun mages, Jess. What a morning you had. It was great seeing you out there. I bet you have very similar “parents feeding baby” shots. Thanks for letting me balance the Beast on the back of your car, haha!